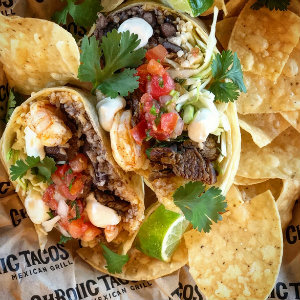 Chronic Tacos just upped its taco game by adding all new Grass-Fed premium Carne Asada to its menu offerings. Now when you’re building your own tacos, burritos, and even Chronic Nachos, ask for high-quality Grass-Fed beef. The steak is extra tasty thanks to a secret marinade for 24 hours, then its seared and seasoned on the open grill, allowing for the boldest flavor. Chronic Tacos serves only the highest quality ingredients and all-natural meats. They offer a wide variety of traditional Mexican items including tacos, burritos, bowl-ritos and more! The menu also features kid’s meals and a breakfast menu available all day. Choose from vegetarian and gluten-free options, as well as choices of: Carne Asada, Carnitas, Al Pastor, Pollo Asado and variations of fish or shrimp. There is something for everyone. At each location, the walls are adorned with original artistic designs inspired by traditional “Day of The Dead” art, creating a unique ‘Taco Life’ experience. Angel Stadium of Anaheim at 2000 E Gene Autry Way in Anaheim. Coming Soon 18503 Suite B Yorba Linda Blvd. in Yorba Linda.